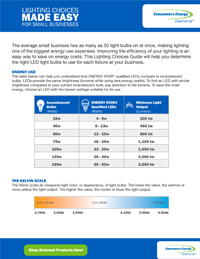 Find the best LED lightbulb choice for your small business by downloading our free Lighting Choices Guide. What is an LED and how do they work? An LED (light emitting-diode) bulb uses semiconductors in plastic diodes to emit light when an electrical current is passed through them. What types of fixtures can I use LED Bulbs in? LEDs bulbs come in all shapes and sizes. Some of the bulbs that we offer include the A-line or A19 shapes which are similar to the standard halogen bulbs that you can use in table or floor lamps. We also offer a variety of flood lights that are typical for use in indoor/outdoor spotlights, track lighting, recessed cans and ceiling lights. Globe and candelabra shaped LEDS can be used in decorative fixtures. How much energy can an LED Bulb save? LED bulbs produce the same amount of light as a halogen bulb can but uses less energy to do so. A 9 watt LED can be compared to a 60 watt halogen bulb in terms of the amount and color of light that it produces. Generally, LEDs bulbs can save up to 80% of energy when they are replacing less efficient halogen bulbs. How long before I have to replace an LED? A high quality, ENERGY STAR® certified LED bulb can be lit up to 25,000 hours. That’s about 22 years with normal daily use (3 hours per day). How do I dispose of an LED once it expires? LED Bulbs do not contain any hazardous materials inside or on the bulb so you can place them in your household trash once they expire. Lifetime Hours: The average amount of time that bulb can stay lit before the end of its life. ENERGY STAR®‘s lifetime hour ratings are based on an average of 3 hour of use per day. Color Temperature: The appearance of light in terms of warmth or coolness. Color Temperatures of 2700K generate a warmer color tone; color temperatures of 5000K generate a cooler color tone. ENERGY STAR®: A U.S. Environmental Protection Agency voluntary program that helps businesses and individuals save money and protect our climate through superior energy efficiency. Products can earn the ENERGY STAR® label by meeting the energy efficiency requirements set forth in ENERGY STAR® product specifications. EPA establishes these specifications based on a set of key guiding principles.